Storage – some well ordered ideas! As you may have noticed, we’re very big on storage ideas at Go Modern. And the trickier the space presented to us the more we love it. There is a great feature in the March 2018 issue of Essential Kitchen Bathroom and Bedroom Magazine about this very thing… featuring a Q&A with … US! So here are a few tips and ideas below based on what we shared with EKBB (although do go out and buy the magazine – it’s always a very good read!). Getting the right balance between storage and space in a bedroom is crucial. We often find clients need more storage than they have space for so we play around with ideas, trying to incorporate storage wherever we can. Building wardrobes right up to the ceiling, using storage beds and tall chests of drawers in smaller spaces. We combine this sometimes with decorative hanging shelves or slimmer wall units. 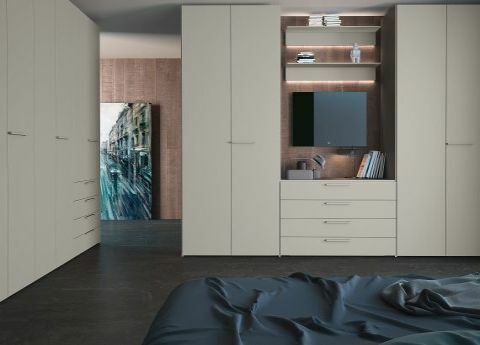 A bridged wardrobe around the head of a bed can also be a great use of space. The result should always work aesthetically as well as leaving you with plenty of space to move around. Italian design has always pushed the boundaries – across fashion, art, architecture… it whole-heartedly embraces the avant-garde. Think of the theatricality of Versace, the revolutionary Renaissance architecture of 15th century Florence or the rebellious drama of Caravaggio.